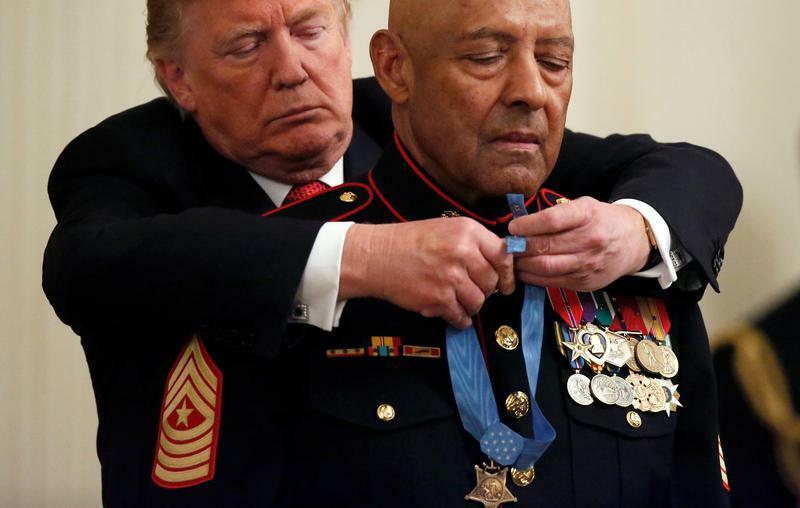 President Trump presented the Medal of Honor to Sgt. Major John L. Canley, a retired member of the U.S. Marine Corps, on Wednesday. Canley was honored for his service during the Vietnam War in 1968, when he repeatedly rushed across dangerous terrain to carry his wounded comrades to safety, despite bearing wounds of his own. When his commanding officer was severely wounded, Canley took charge and led his fellow soldiers. Mr. Trump has emphasized honoring military members who sacrifice for the country, reiterating his commitment to defense spending and to veterans and their families. Last week, however, the president suggested that Rep. Devin Nunes, a controversial conservative in Congress who heads the House Intelligence Committee, should get the Medal of Honor for defending him in the Russia probe. The president revised that to say perhaps it should be called the Medal of Freedom.